The stunning lagoon city of Venice has long attracted painters and printmakers seeking to capture her brilliant architecture and limpid light. 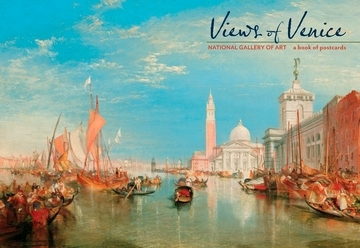 Canaletto was the most renowned among the view painters of Venice in the eighteenth century, but other artists also were in great demand, including Canaletto’s nephew Bernardo Bellotto, his rival Francesco Guardi, and his follower Antonio Joli. These and other painters satisfied the market for images that reminded visitors of their experience abroad after their return home. While in Venice on the Grand Tour, travelers marveled at the religious, political, and social center of the city, the Basilica of San Marco and its adjacent piazza, one of the most striking architectural ensembles in Europe. Visitors also admired the Gothic and Renaissance palaces that lined the Grand Canal, the numerous opulent churches, and the famous Rialto Bridge. Tourists often brought back souvenirs, including sculptures, prints and drawings, books, and particularly view paintings of these familiar and storied sights. After the fall of Venice to the French in 1797, foreign artists dominated the market in views of the former republic. Richard Parkes Bonington was among the British artists to represent Venice in the early nineteenth century, followed by the more prolific painter and watercolorist Joseph Mallord William Turner. Turner, who visited Venice three times during his life, moved his attention away from the topographical focus of eighteenth-century view painters to the creation of dazzling effects of light and atmosphere. French writers and artists also discovered the charms of the picturesque city. Stendhal wrote admiringly of the city, perhaps providing the inspiration for the Venetian works of Jules-Romain Joyant, the self-styled “French Canaletto.” Later, Claude Monet’s only trip to Venice in 1908 produced important modernist works of major sites. Among other European artists, German painters deserve particular attention for capturing the spell of the enchanting city. After the Civil War, Americans began to visit Venice, Rome, and Florence in large numbers. James McNeill Whistler and John Singer Sargent were among the most significant American artists to depict Venice in the later nineteenth century. In contrast to contemporary British and French painters, they sought to capture the local inhabitants’ experience. Although Whistler and Sargent sometimes rendered the monumental and well-known attractions of the city, they also emphasized a Venice of the Venetians, depicting the narrow alleys, minor squares, and deserted canals that were an integral part of everyday life. Paintings by all these artists and more are included here.